Mascouche will be one of the terminal stations of the Train de l'Est commuter line. Image courtesy of Agence métropolitaine de transport. Rail track and supportive pillars being installed at the Rivière-des-Prairies station. Image courtesy of Agence métropolitaine de transport. Repentigny is one of the new stations being built for the new commuter rail line. Image courtesy of Agence métropolitaine de transport. Bombardier dual mode locomotives will be used on the Train de l’Est commuter line. Image courtesy of Agence métropolitaine de transport. Train de l’Est (or the Mascouche Line) is a new commuter rail line under construction in the Montreal metropolitan area in Quebec, Canada. The 52km-long line will connect Montreal’s Central Station with Mascouche, a suburban city located north of Montreal in southern Quebec. Train de l’Est, with 13 stations along its route, will provide public transit services for Montreal East and the north-eastern municipalities such as Repentigny, Terrebonne and Mascouche. Agence métropolitaine de transport (AMT) is developing the project with an estimated investment of $671m. Transports Quebec, the Transport Ministry of Quebec, is financing 75% of the project cost, while the rest 25% is borne by AMT. Construction of the project was more than 80% complete as of January 2014. The line is expected to open for service by the year end. The daily ridership on the new route is projected at 11,000. The line will start in Mascouche and pass through suburban areas such as Terrebonne, Repentigny and Charlemagne before running for approximately 30km on the existing Canadian National (CN) railway tracks. After passing through Ahuntsic, the line runs for 9km on AMT’s existing Deux-Montagne commuter line that enters downtown Montreal through the Mount Royal Tunnel. Metro de Paris is a rapid transit metro system serving the capital city of Paris within the Île-de-France region, France. The north section of the line between Terrebonne- Repentigny will use newly laid tracks on the median on Highway 640. The development of the southern section of the line involves upgrade of the existing CN railway tracks. The Train de l’Est commuter line will have stoppages at ten newly constructed stations and three existing stations. The existing stations on the line are Montreal Central, Canora and Mont-Royal. The Montreal Central Station, used by approximately 18 million passengers a year, is one of the busiest railway stations in Canada. Via Rail and Amtrak operate their trains from the Montreal Central Station. The Canora and Mont-Royal stations are located on AMT’s Deux-Montagnes Line. A garage and a shelter for parking the Train de l’Est trains will be located at the terminal station Mascouche. The other nine new stations include Terrebonne, Repentigny, Pointe-aux-Trembles, Rivière-des-Prairies, Anjou, Saint-Léonard-Montréal-Nord, Saint-Michel-Montréal-Nord, Sauvé and Ahuntsic. Trains travelling to the Central Station will switch from diesel to electric power at the Ahuntsic station, while the trains travelling to Mascouche Station will shift from electric to diesel. "The Train de l’Est commuter line will have stoppages at ten newly constructed stations and three existing stations." The Train de l’Est commuter line will use Bombardier’s double decker passenger cars capable of operating on both diesel and electric power. The travel time between Mascouche and Montreal using these trains is estimated to be 62 minutes. The project includes construction of new tracks in the median of Highway 640 apart from the construction of new stations and the upgrade of existing tracks. A 1,000m long railway trestle is being built between the Highway 640 and the Highway 40 interchange, and the Terrebonne Station for the rail line to cross over the highway to reach the highway median. A number of other railway trestles and overpass structures will be built along the Highway 640 route. Bombardier was awarded a contract by AMT in December 2007 to supply 30 double-decker passenger cars for the Train de l’Est commuter line. 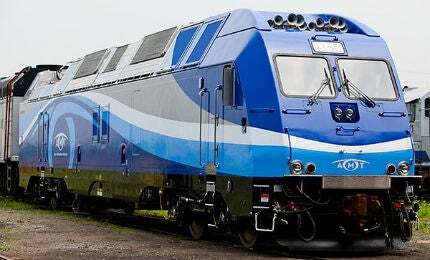 AMT also awarded Bombardier a contract in August 2008 to supply five dual-mode locomotives to be operated on the line.